Education: Graduated from Colfax High School. Has bachelor’s degree in accounting with minor in economics from Eastern Washington University. Work experience: Farmer and small-business owner for 35 years. Political experience: State representative representing 9th Legislative District since 2007. Served on Washington Barley Commission from 1990 to 1997 and National Barley improvement Committee from 1991 to 1996. Education: Graduated from Rogers High School in Puyallup, Washington. Has bachelor’s degree in political science and pre-law from Washington State University. Working on master’s degree in global security policy. Work experience: Joined U.S. Army at 17. Deployed on a humanitarian aid mission to El Salvador as an noncommissioned officer. Currently an officer in Washington National Guard. Political experience: Vice chairman of Whitman County Planning Committee. Current member of the Pullman Board of Adjustment and Pullman Police Advisory Committee. Briefly campaigned for Congress last year before opting not to run for position. For the first time in a decade, a Democrat is challenging state Rep. Joe Schmick for his seat representing southeastern Washington. Matthew Sutherland, a graduate student at Washington State University, hopes to benefit from a nationwide “blue wave,” with Democrats hoping voters dissatisfied with President Donald Trump will vote for their party down the ballot. But he faces a significant challenge. Sutherland finished more than 20 percentage points behind Schmick in the August primary. Democrats, however, saw a silver lining in the result. Sutherland had the best performance by a Democratic candidate in races for either 9th Legislative District house seat since 1992. Schmick said enthusiasm from Democrats this election season means he will have to work harder. 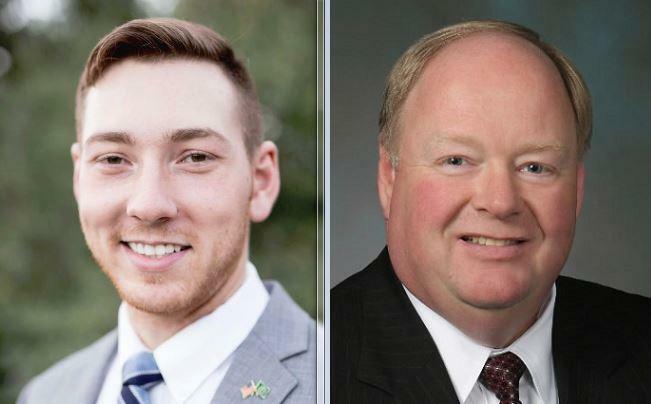 “I think you saw a pretty clear pathway out of the primary, but ultimately the voters will decide who sits and who’s the best person to represent them in Olympia,” Schmick said. Sutherland’s campaign has raised $50,000 compared with the $93,000 raised by Schmick’s re-election effort. Among Schmick’s top contributors are Avista Corp., Pharmaceutical Research and Manufacturers of America and United Health Group Inc., along with a variety of other pharmaceutical and health insurance corporations. Sutherland’s campaign is backed by the International Brotherhood of Electrical Workers Union, as well as number of other regional trade unions. Sutherland said he hopes his campaign is boosted by 1,500 students who have registered to vote at Washington State University since classes began. Health care initiatives comprise a significant portion of Sutherland’s platform. He said he backs a publicly funded “Medicare-for-all” health care system. His plan includes cutting out health care insurance corporations, saying they are wasting taxpayer dollars and doctors’ time while prescribing unwarranted care to patients. “The only person that should be deciding your care is you and your doctor, and right now that’s not the case,” Sutherland said. Schmick said other states – such as Vermont and North Carolina – tried publicly funded health care models before concluding it was too expensive. He said he believes patients will lose control of their health care decisions. He added that those who are uninsured have options to be covered if they choose. “I don’t know where these folks are that are not covered. If they’re not covered, they’re choosing not to,” Schmick said. According to a March report from the Department of Financial Management, 8.5 percent of 9th District residents are uninsured as of 2016 – above the state’s average of 5.4 percent. K-12 education figures to be another contentious topic in the 2019 legislative session. In 2017, the state Legislature significantly boosted education funding in response to a state Supreme Court decision that said the state wasn’t adequately funding education. This year, the court determined that the deal approved by the Legislature and Gov. Jay Inslee satisfied its ruling. Schmick voted against the state budget that included the new funding. He also opposed changes in the property tax system that also were part of the agreement. Sutherland said the state needs to go far beyond the boost already made and find a sustainable source of revenue so that taxpayers no longer have to front the costs of education through levies and bonds. Schmick said he supports lowering tuition at state institutions and increasing the amount the state budgets for need grants for prospective students. He said he is concerned with the debt students are leaving college with, but also wants to make sure they are getting degrees in fields with job opportunities. Sutherland said he favors a tuition cap to curb skyrocketing student loan debt. “It’s getting to the point where we are pricing working families out of educational opportunities, and that’s not fair, that’s not the American dream,” Sutherland said. Sutherland also said he supports providing two years of free community college, as well as funding apprenticeships, trade and tech programs as alternatives to college. Schmick said he wants to continue creating jobs across the district while living within the means of the budget. He said he wants to ensure small communities have an opportunity to be successful and run their businesses locally. Schmick sponsored a bill that would have lowered the business and occupation manufacturing tax rate to .2904 percent, down from .484 percent. The bill died in committee, but he said there will be opportunities to continue pursuit in 2019. Sutherland said he will propose a reform to business taxes. He said they are currently stifling to small-business owners while giving exemptions to those at the top. He said he wants to get rid of the exemptions, lower the rate and have it more evenly applied, which he said will relieve the burden on small-business owners and increase revenue for the state. He also wants to implement a 7.5 percent excise tax on capital gains to grant further relief to working families. In a February vote, Schmick voted to continue withholding certain public records from the public. The bill, which had strong support from both parties, passed the Senate 41-7 and was later approved 83-14 by the House. It was vetoed by Gov. Jay Inslee after strong public outcry. Schmick said he always has provided public records when asked, even when it was not required. Sutherland is the youngest legislative candidate on the Washington ballot. He announced last year that he would run for Congress against incumbent Republican Rep. Cathy McMorris Rodgers, but abandoned his bid in November and endorsed Democrat Lisa Brown. Schmick said he is honored to have served the people of the 9th District for the past decade. “I think people in the 9th District appreciate the fact that we’ve tried to live within our means,” Schmick said.